It seems like any word with a double 'f' will display the first f correctly, then the second will also appear as above. Also, capital 'F' is displayed fine, per above. I can't for the life of me understand what's going on here. I've tried forcing a \clearpage then sticking in some random words that aren't rendering correctly on the prior page, but they render fine in the new page. It's using smallcaps, and all lowercase letters are appearing with the same strange shaded box. 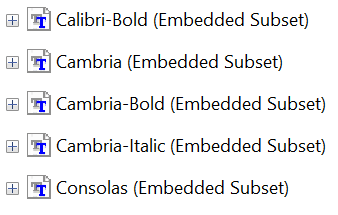 Even if they weren't, I'm printing from a machine that does have those fonts, so I doubt that's the problem. My hope is that it's actually just a printer/print driver problem, and I will have no issues when sending my book off to be printed for real. However, I'd like to know that for sure before I do. EDIT: turns out, this problem is only present if I print from Chrome. If I instead print from Adobe Reader, it looks perfect. I have no idea what this means in terms of the underlying problem, but I'm hoping it means it's not a problem with my document per se. Browse other questions tagged fonts printing or ask your own question. What paper dimensions to use for printing with the octavo class?